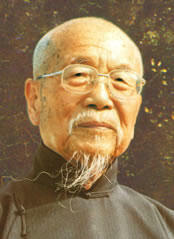 Han Lao Qian Ren (Grand Senior Elder), given name En-Rong also known as Yu-Lin, called himself "Bai-Shui-Lao-Ren ". He was born in 1901 in Ninghe, Hebei Province of China. Since childhood, Han Lao Qian Ren had received family classic teachings with etiquette and filial piety. He was erudite well-versed in literary works and martial arts. Han Lao Qian Ren started his career with Da-De-Long dyeing and textile mill. The business became more and more prosperous under his diligent management. However, for his constant overwork, he was ill with incurable tuberculosis at the age of 37. Then he received Tao and was greatly blessed with the mercy of Ji-Gong Buddha, who snatched his life from the jaws of death. From then on, Han Lao Qian Ren was determined to propagate Tao wholeheartedly. He made vows to preach the gospel of the Almighty God, and to bring salvation to the world. So when he had his family and business settled, Han Lao Qian Ren followed the Eighteenth Patriarchs, Shi-Zun and Shi-Mu, by assisting them with the holy enterprise of propagating Tao. In 1948, Han Lao Qian Ren was ordained by Shi-Mu to lead several senior elders to start the pioneering mission in Taiwan, where he settled on Sanming Road in Taichung. The initial years were full of hardships and sufferings, especially those from the government and the public. But he was very persevering to resolve misunderstandings. He showed virtuous modesty to stabilize Tao affairs under difficult circumstances. His sincerity touched all the people around him. Not until twenty years later, when Han Lao Qian Ren moved to Weidao Road, did he manage to break through the impasse; Tao propagation started to prevail throughout the island. Years later, Han Lao Qian Ren prepared to build a memorial hall for the Patriarchs and Kuang-Ming Cultural Library at the Fu-Shan Garden. Meanwhile, Tao started to spread to other countries. By the year of 1980, Han Lao Qian Ren had been ordained with Heavenly Decree. He established Kuang-Ming Nursing Home to care for the destitute aged in Puli, Nantou County. He also built the grand and majestic Tian-Yuan Buddha Temple, which has become a memorial for Han Lao Qian Ren 's propagation of Tao in Taiwan as well as a scenic beauty for numerous Tao members from all over the world to trace the root. Han Lao Qian Ren had practiced Tao diligently for more than fifty years. He fulfilled his lifelong commitment to arouse the universal truth and the value of life. He devoted himself to glorify the essence of Confucianism. Having constantly admonished the restoration of ethics, Han Lao Qian Ren helped eradicate evils and maintained social stability. For his eminent contribution to the society, he was awarded by the government the glory of Chinese Top Honor Medal. Han Lao Qian Ren at the age of 95 answered the merciful call from the Almighty and return to heaven. Throughout his life he endured sufferings and hardships without complaint; he enlightened people without weariness, and he adhered to his great vows without cease. His influence is widespread and far-reaching. His departure left countless Tao cultivators crying with the reminiscence of deep reverence and great gratitude.